An opinion piece published by the American Society for Microbiology (with a popular summary here, titled Has Modern Science Become Dysfunctional?) about the increasingly perverse incentives in modern science. Despite the implication of the title, the authors are not arguing that science is failing to produce new or useful knowledge, merely that the social system of rewards discourages the type of curiosity-driven investigation that drove the dazzling scientific discoveries of the 20th century. On this point, I am highly sympathetic. To be successful, today's scientists must often be self-promoting entrepreneurs whose work is driven not only by curiosity but by personal ambition, political concerns, and quests for funding. They go on to argue that this hyper-competitive system does not, in fact, produce the best possible science because scientists choose projects based on their likelihood of increasing their payoffs within these narrow domains (more grant dollars, more high profile publications, etc. ), rather than on their likelihood to produce genuine scientific progress. In short, scientific progress only sometimes aligns with ambition, politics or funding priorities, but behavior almost always well, eventually. This line resonated particularly strongly. When my non-academic friends ask me how I like being a professor, I often describe my first two years in exactly these terms: it's like running a startup company (nonstop fund raising, intense competition, enormous pressure) with all "temp" labor (students have to be trained, and then they leave after a few years). There are certainly joys associated with the experience, but it is a highly stressful one, and I am certainly cognizant of the reward structures currently in place. Continuing the above theme, Carpenter writes about particular issues within Psychology. The problem is known as the "file-drawer problem" in which negative results tend not to be published. Combine that with noisy results from small sample sized experiments and you have a tendency for statistical flukes to be published in high profile journals as if they were facts. Carpenter describes an interesting community-based effort called the PsychFileDawer to push back against this pattern. The idea is to provide a venue for studies that only try to replicate existing claims, rather than focus on novel results in experimental psychology. Carpenter's coverage is both thoughtful and encouraging. That being said, experimental psychology seems better positioned to succeed with something like this than, say, complex systems. "Complex systems" as a field (or even network science, if you prefer that) is so broad that well defined communities of dedicated, objective researchers have not really coalesced around specific sets of questions, a feature that seems necessary for there to be any incentive to check the results of published studies. For Science Ph.D.'s, There Is No One True Path, by Jon Bardin. Both in the Chronicle of Higher Education. These pieces cover parts of the larger discussion about the crisis in higher education. The first is more about the humanities (which seem to have a greater disdain for non-academic careers than the sciences? ), while the second focuses more on the benefits of getting a science PhD, in terms of intellectual sophistication, problem solving, project completion, etc., even if your career trajectory takes you outside of science. I'm highly sympathetic to the latter idea, and indeed, my impression is that many of the most exciting job opportunities at technology companies really demand the kind of training that only a PhD in a scientific or technical field can give you. Update 6 April: Regarding the point in #2 about complex systems, perhaps I was too hasty. What I'd meant to suggest was that having a community of researchers all interested in answering the same basic questions seems like a sufficient condition for science to be productive of genuinely new knowledge. In other words, the best way to make forward progress is to have many critical eyes all examining the problem from multiple, and some redundant, angles, publishing both new and repeated results via peer review . But, this statement seems not to be true. Cancer research can hardly be said to have a dearth of researchers, and yet a new editorial written by a former head of research at the big biotech firm Amgen and an oncology professor at the University of Texas argues that the majority of 'landmark' (their term) studies in oncology, many of which were published in the top journals and many of which spawned entire sub-disciplines with hundreds of followup papers, cannot be reproduced. First, we know that a paper being peer reviewed and then published does not imply that its results are correct. Thus, that 47 out of 53 results could not be reproduced is not by itself worrying. But, what makes it a striking statement is that these results were chosen for testing because they are viewed as very important or influential and that many of them did generate ample followup studies. That is, something seems to have interfered with the self-corrective ideal of the scientific community that scientists are taught in graduate school, even in a field as big as cancer research. "The best story." Since when has science been about the best story? Well, since always. The problem, I think, is not so much the story telling, but rather the emphasis on the story at the expense of the scientific, i.e., objectively verifiable, knowledge. It's not clear to me who in the peer-review pipeline, at the funding agencies or in the scientific community at large should be responsible for discouraging such a misplaced emphasis, but it does seem to be a problem, not just in young and diffuse fields like complex systems (or complex networks), but also in big and established fields like cancer research. Being published after peer review is supposed to mean that there are no obviously big mistakes. But, in practice, peer review is more of an aspirational statement, and passing it does not necessarily imply that there are no mistakes, even big ones, or obvious ones. In short, peer review is a human process, complete with genuine altruism, social pressures, "bad hair days," weird incentives and occasional skullduggery. The hope is that it works, on average, over the long run. Like democracy is for forms of government, peer review may be the worst way to vet scientific research, except for all the others. Can you imagine the NIH funding such a big effort to check the results of so many studies? I cannot. This video of Steve Jobs' commencement address at Stanford in 2005 sat on my to-watch list for months. Now seemed like a good time to watch it. Good words, Steve. While chatting with Jake Hofman the other day, he pointed me to some analysis by the Facebook Data Team about the way people use online social networks. One issue that seems to come up pretty regularly with Facebook is how many of your "friends" are "real" in some sense (for instance, this came up on a radio show this morning, and my wife routinely teases me for having nearly 400 "friends" on Facebook). A related point that I've found myself discussing several times recently with my elders (some of whom I think are, at some level, alienated and befuddled by computer and Web technology), is whether Facebook (or, technology in general) increases social isolation, and thus is leading to some kind of collapse of civil society. I've argued passionately that it's human nature to be social and thus extremely unlikely that technology alone is having this effect, and that technology instead actually facilitates social interactions, allowing people to be even more social overall (even if they may spend slightly less time face-to-face) than before. Mobile phones are my favorite example of social facilitation, since they allow people to interact with their friends in situations when previously they could not (e.g., standing in line at the bank, walking around town, etc. ), even if occasionally it leads to ridiculous situations like two people sitting next to each other, but each texting or talking on their phones with people elsewhere. And, just in time to bolster my arguments, The Pew Internet and American Life Project released a study this week (also discussed in the NYTimes) showing that technology users are more social than non-technology users, and that other, non-technological trends are to blame for the apparent decrease in the size of (non-technology using) Americans' social circles over the past 20 years. Of course, access to and use of technology often correlates with affluence, so what really might be going on is that, like with nutrition, the affluent are better positioned to lead physically and socially healthy lives than the poor. Recently, for a project on evolution, I've been reading pretty deeply in the paleontology and marine mammal literature (more on that in the next post). The first thing that I noticed is how easy it is now to access vast amounts of scientific literature from the comfort of your office. Occasionally, I had to get up to see Margaret, our librarian, but most of the time I could get what I needed through electronic access. But, sometimes I would encounter a pay wall that my institutional access wouldn't allow me to circumvent. If you're male, when you use a public restroom, what do you think about for those seconds while your body is busy but your mind is free to wander? Randall Munroe, of xkcd fame, apparently, thinks about the mathematics of restroom awkwardness and minimum awkward-ness packing arrangements for men using urinals. Who knew something so mundane could be so amusing? There is a need for caution when attributing causality to correlations in health outcomes between friends using non-experimental data. Confounding is only one of many empirical challenges to estimating social network effects, but researchers do need to attempt to minimise its impact. Thus, while it will probably not be harmful for policy makers and clinicians to attempt to use social networks to spread the benefits of health interventions and information, the current evidence is not yet strong enough to suggest clear evidence based recommendations. There are many unanswered questions and avenues for future research, including use of more robust empirical methods to assess social network effects, crafting and implementing additional empirical solutions to the many difficulties with this research, and further understanding of how social networks are formed and operate. E. Cohen-Cole and J. M. Fletcher, "Detecting implausible social network effects in acne, height, and headaches: longitudinal analysis." BMJ 337, a2533 (2008). Update 10 Nov.: Oh jeez. Olivia Judson, please get a clue. I have rather mixed feelings about Malcolm Gladwell's writing. His books (e.g., Tipping Point and Blink) tend to be rather pseudo-scientific, but that hasn't stopped them from becoming virtual textbooks in the business community. On the other hand, his writing for The New Yorker is often excellent. For instance, his latest essay on criminal profiling is a wonderful skewering of the sleight of mind that criminal profilers (perhaps unknowingly) perform on their law enforcement clients. In fact, I think there's probably a great business opportunity for taking classic computer science problems (SAT, vertex cover, sparsest cut, etc.) and turning them into entertaining puzzle games. Finally, Brian Hayes, an intelligent amateur mathematician who frequently writes for the American Scientist magazine, has a pleasantly diverting essay on division and various algorithms for doing it. I remember learning the long-division algorithm in grade school and hating it. The only value I can see of learning long-division is that it teaches us that there's a symmetry in mathematical operations (addition and subtraction, multiplication and division, integration and differentiation, etc. ), and helps build intuition into the relation of various numbers to each other. Otherwise, I think it's a complete waste of time (no one, not even careers in mathematics, uses long-division). Hayes, however, points out that while algorithms for addition, subtraction and multiplication are relatively straight forward, a legitimate and interesting question is Why is the algorithm for division so opaque? Last week I read an excellent article by David Owen in The New Yorker about light pollution, and the phenomenon of "sky glow". Living in New Mexico, I'm lucky to have relatively dark night skies compared to places on the coasts where light from the big cities consistently washes out most of the stars in the sky. But, the New Mexican sky (pictured below, in a long exposure; picture taken from the article) is not nearly as dark as the sky I remember in central Belize where it was so dark that you could see both man-made satellites passing overhead (these are easy to spot because of their slow but constant movements), as well as the magnificent Milky Way. To think that most views of the night sky were like that is a bit mind boggling. 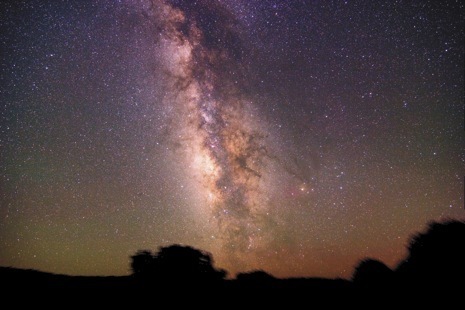 More information at the International Dark-Sky Association (IDA), including information about lighting fixtures that can both reduce light pollution and save energy, lighting laws and dark-sky activities in parks in preserves. Back from a relaxing but oppressively humid vacation on the South Carolina shore, I've missed a lot of interesting science news. Someone asked me recently if I literally read the things I blog about while I let my simulators run. The answer is... well, sometimes. It's true that I do spend both a lot of time reading and a lot of time simulating things, so naturally there will be a lot of overlap between the two activities. Anyway, here is a list of some interesting stories I missed over the past week. My long-time friend Nick Yee recently sat on a CNN panel to discuss the impact and evolution of virtual worlds (online video games). This video is an 8 minute clip from the longer program on the subject. Nick is probably the world's expert on the culture and psychology of online gaming, and particularly for the massively multiplayer online roleplaying games (MMORPGs) like World of Warcraft, City of Heroes, or Second Life. He started his research (much of which appears on his Daedelus Project page) while we were both at Haverford and when online gaming hadn't hit the mainstream the way it has today. If you want to understand what virtual worlds and online gaming are about, his work is the place to go. Also briefly featured is Philip Rosedale (CEO of Linden Labs, which makes Second Life), whom I recently met at a Santa Fe Institute business network meeting. Nick tells me that the clip is airing worldwide on CNN this week, and that he's working on a book on the subject as well. Update 16 June: Nick's posted a brief writeup about his appearance. YouTube and Viacom are finishing their negotiation over Viacom's content's availability on YouTube in the courts. My sympathies certainly lay with YouTube's democratization of content creation and distribution. And, much as my democratic prejudices incline me to distrust monopolistic or imperial authorities, I agree that old media companies like Viacom should have a role in the future of content, since they're rather invested in the media whose creation they helped manage. Mostly, I think these old media empires are afraid that new technologies (like YouTube) will fundamentally change their (disgustingly successful) business model, by shifting the balance of power within the content business. And rightly so. The physics of the very small still has a few tricks up its sleeve. Actually, I find the discovery of the D-meson state mixing (previously thought impossible on theoretical grounds) rather reassuring. There are clearly several things that are deeply confusing about our current understanding of the universe, and it's nice to be reminded that even boring old particle physics is a little more complicated than the ridiculously successful Standard Model gives it credit for. (This one is a bit old, but still good, even 5 mouths out.) Last year, during the American leg of his book tour for The God Delusion, the indefatigable Richard Dawkins (whom I often write about, try here, here, here, and here) read a few excerpts to an audience at Randolph Macon Women's College in Lynchburg VA. Immediately afterward, he did an hour of Q&A with the audience, many of whom were from nearby Liberty University. Dawkins handled the frequently banal questions with both wit and aplomb. Building on this theme, The New Atlantis has a nice article on the topic of the moral role that modern science plays in society. On similar point, The American Scientist has a piece on the use and misuse of complex quantitative models in public policy, at least in terms of the environment. Being militantly critical of bad science in all forms, I wholeheartedly agree with the basic argument here - that good models must be predictive, accurate, interpretable, and live as close to the empirical evidence as is possible. Since models and theories are basically interchangeable formalisms, let me mangle one of Einstein's more popular quotations: Evidence without theory is lame, theory without evidence is blind. In my frenetic drive to get a paper revised and resubmitted to a journal, and a parallel project writing a lengthy solo-paper on complex systems methodolodogy, I now have a backlog of interesting tid-bits to share. So, rather than blog about each individually, I'm collecting them together in the second of our multi-part series of things to read while you wait for the simulator to finish. As if this topic is on many people's minds of late, Cosma blogs about Ginsparg's excellent perspective piece in The Journal of Neuroscience entitled As We May Read (which is a riff on Vannevar Bush's 1945 piece in The Atlantic entitled As We May Think, about the obligation of post-war scientists to make more accessible the store of human knowledge). Ginsparg, the creator of the arxiv and a recipient of a MacArthur award in 2002, has a lot to say about the future of academic publishing and the role that journals have in disseminating information. On a related point, hunch.net has some perspective on the development of collaborative research, and, for instance, the impact of Wikipedia on Vannevar Bush's dream. Liberal arts colleges have a special place in the constellation of academic training, although most Americans would be hard-pressed to name any of them. Writing in a 1999 special issue of Daedalus on liberal arts colleges, Thomas R. Cech (Nobel Prize in Chemistry, 1989; current President of the HHMI; graduated from Grinell College in 1970) writes on the disproportionately large number of liberal arts graduates who make up the nation's top scientists, why liberal arts colleges can give a better science education than large universities, and the importance of protecting the contributions these institutions make to science.